Earn up to 7,192 reward points. 88-note keyboard controller with built-in audio interface and integrated road case. Introducing the Akai Professional MPK Road 88, a hammer-action 88-key controller with an integrated road case and 4-output USB audio interface, designed for the touring professional who demands the best in natural response and creative versatility. Akai Professional knows keyboards: Their MPK and Advance series controllers are constant fixtures in studios and on stage because of their impeccable build quality and player-centric response. The MPK Road 88 takes that legacy and puts it on the road for the touring professional. For the keyboard player, feel is everything—at its core, the Road 88 features a premium 88-key velocity-sensitive graded hammer action keybed with aftertouch, meticulously engineered so the most demanding keyboardist can capture every nuance of their performance. Add to that the built-in soundcard and the tough, road-ready case, and the touring pro has everything they need, without compromise. Virtual Instruments play a pivotal role in both studio music production and live performances, offering players countless sounds and effects to shade and color their music. With Road 88’s integrated class-compliant 4-output soundcard and superior player-centric response, users can route their virtual instruments to mixers and monitoring sources simultaneously for hassle-free setups. 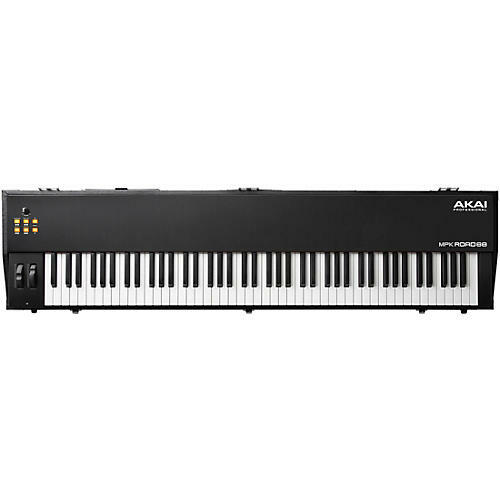 This keyboard enables players to manage and employ their VI collection to maximum effect, with a keybed designed for optimum expressive capability. The Centrepiece of your Performance Whatever the next performance demands, Road 88 will easily meet the challenge. Thanks to dual expression pedal inputs, a sustain pedal input, 5-pin MIDI-In, and MIDI-Out ports and class compliant USB connectivity, Road 88 connects to all your outboard gear and is ready for any situation. Everything the professional Keyboard player is thoughtfully included. Pitch and Mod Wheels combine with dedicated volume control, transpose functionality and split modes for complete versatility and adaptability in any performance environment where core-workstation control is required. With Road 88, everything you need is all available in one portable package. Fusing a vintage-inspired travel case with carrying handle, this premium-response keyboard is ready to withstand the rigors of the road. Forget complicated rigs—with Road 88, players will focus on what’s important: delivering their best performance. Great feel, superior response, road-worthy toughness.